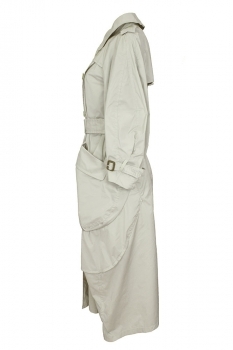 High 'Dialect' Summer trench coat. 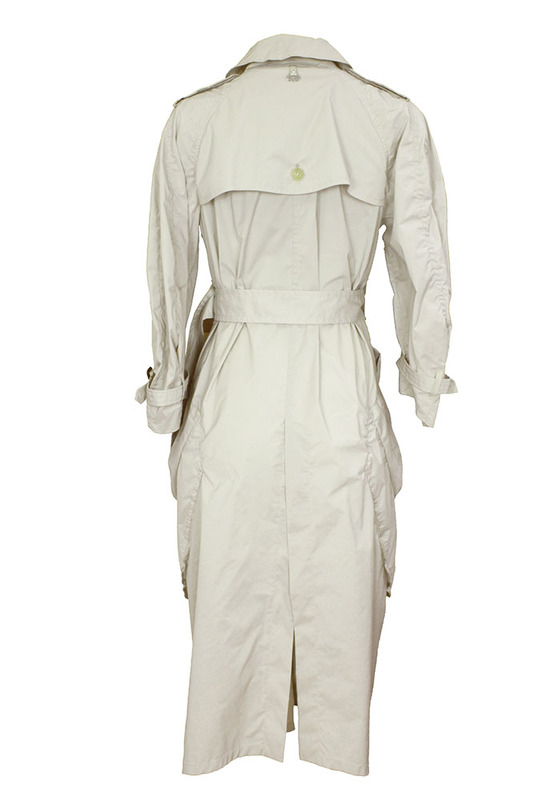 Soft, unconstructed trench coat in taupe technical taffeta with double breasted front fastened with pale horn buttons, 2 columns of 5 buttons. Generous 3/4 length raglan sleeves with removable epaulettes (button fastened) and buckle belt fastenings at cuffs. Rounded oversize patch pockets with buttoned flaps. Storm flap at rear with button fastening and metal 'High' tag below neck. Fabric belt with leather covered buckle. Long central vent at the rear. Unlined, lightweight, summer style. Extra long length. Super cool, Impact and water repellent, windproof, perfect for everyday wear. A great piece of clothing.